Hi All - I seem to have the 5V reset issue with williams IJ . It was resetting on Friday night when I had it on alongside a bunch of other machines for an extended period. Haven't had the problem before or since (though rarely have it on for that amount of time) but the pinsound diagnostic file confirms that its dropping to 4639mV. I'm following the pinwiki advice on problem solving this, and so far can show that I have a solid connection between Power and Driver board (only a 0.02 VDC drop). So next step was testing Bridge Rectifier and Capacitors. Caps seemed ok at 250mV AC, BUT...the Bridge Rectifier was coming in at 11V when it should've been 9V. This seems weird! If it was duff it should be showing about 7V so I don't understand why it would be higher than 9. Any thoughts? From what I could see, the positive lead of BR2 (which is what i was measuring) did seem to have a slightly rubbish looking solder connection - but would this cause an increase in voltage? And how would this in turn lead to a drop below 5V elsewhere. Next step is likely going to be taking the board out for a better look, but any advice on what I've found so far would be much appreciated. I would look at changing the caps especially on the 5v rail. carry out these checks first. or the J101 power input connector. If still less than 4.9V then replace LM323K rectifier. the two boards is at fault. and the connector may need replacing long term. Also check for dry joints on the soldering. Yeah this is in line with the pin wiki advice. I've done those checks and voltages are good (4.94). and the drop between the two boards is 0.02, so in theory all good. BR2 should read as 9V, but I'm getting 11V. So looks like replacing BR2 and the c5 should sort it, but I was curious why the voltage had gone up and not down. Pinwiki says your BR2 is knackered if its down at 7V. Yes - the soldering also looks a bit dodgy from what little I can see. If I'm taking the whole board out I will change the BR and Cap and check all solders. It is more likely that there is a bad power connector. Would you just suggest replacing BR2 and the caps then? Anything else? I'm looking at your kit on the website. Ok, now have the board out ready for replacement parts. Unsurprisingly it’s had this fix before. How do the repairs look to you guys - there’s a few more fixes dotted around the board than I’d hoped for. Nothing to lose in making fresh fixes I suppose, but wanted to gauge how this looks to experienced eyes. Cost of a new board is pretty high so I’m hoping this one is still in good enough shape. You should try the replace the connector advise first. In my view this is a big factor in resets. 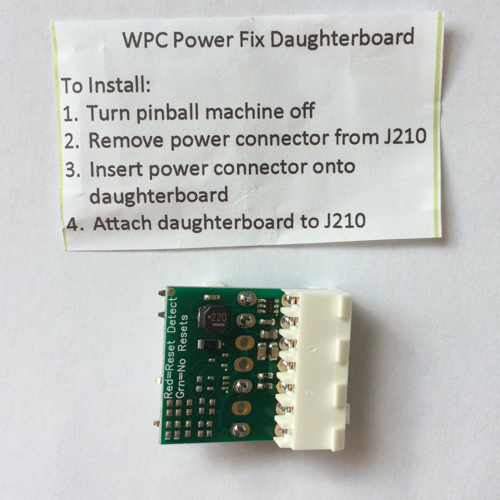 It’s hidden by the fact that to do these repairs you have to take the board out and in the process reseat all the connectors. When you put it back in, it appears fixed only for the connector problem to re-emerge in the future. Check the previous repair tough, in particular the soldering of the bridge on the component side of the board which is often poorly carried out. Don’t stump up for a new board, the one you have will be perfectly serviceable. You should also add some wire links between br2 and c5. The original tracks are on the component side of the board. As c5 has been replaced chances are the through hole plating has been ripped out, so you cannot guarantee good connectivity to the capacitor where it meets the track under its own body. Thanks Andy, great advice. I did reseat everything that pinwiki and the above posts suggested, but was still getting an 11v reading at BR2. The actual reset issue is only happening very rarely so hard to replicate. I’m just trying to be proactive and stop it before it gets any worse really. There’s some funkiness going on already on the tracks between br2 and c5 ! In my experience it could be several things. Thats the "lazy" fix but a nice simple solution sometimes. Crap - I would’ve probably opted for the lazy fix had I known it was there. I ordered the ‘proper’ fix so i’ll try that first and see how I get on. Good to know there’s a backup solution though. Urgh...The postage and hassle isn’t worth it. Plus I have the board out now and can see what I’m dealing with - might as well tidy it up a bit and try to sort it properly.